The kitchen is the heart of the home, and as such you want it to be as comfortable and inviting as possible. When it comes to selecting kitchen countertops, Portland homeowners sometimes need a little guidance in finding the best material. Before rushing to kitchen or tile stores, Portland residents should evaluate the pros and cons of the most popular countertop materials so they can find one that best matches their kitchen lifestyle and budget. Set a budget for your kitchen remodel. Determine the reason for needing or wanting a new countertop. The reason you name can help narrow down your choices. 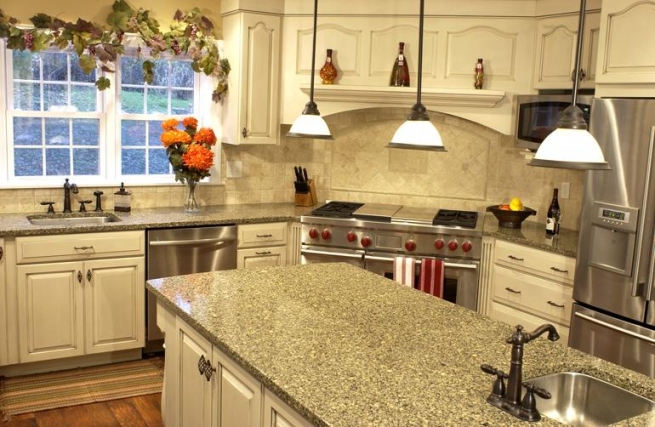 Learn about the different countertop materials available. Pros: Holds heat well; available in a variety of colors; lasts a lifetime; durable. Cons: Expensive; absorbs stains if not sealed; cutting on it can dull knives. Pros: Engineered stone comes in more modern styles than granite; the nonporous surface resists scratches and stains; simple to maintain. Cons: Expensive; stains easily if not sealed well; scratches easily; porous; many need periodic resealing. Pros: Durable; simple to clean; wide range of price options; can be a DIY project; withstands hot objects; simple to clean; available in a variety of colors and textures; you can create your own countertop design using different tile colors. Cons: Grout joints need to be sealed and can become dirty. Pros: Inexpensive; pieces are cut to size; provides a smooth surface; available in a variety of colors; simple to maintain; durable. Cons: Seams show; specialty edging or finishing can be expensive. Before choosing between granite, quartz, marble, laminate or tile, Portland homeowners should visit a showroom to see the material in person. This provides the opportunity to experience the colors and textures in a way that’s more hand-on than a catalog or web browser.